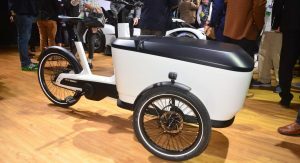 Meet Volkswagen’s smallest commercial vehicle ever, the Cargo e-Bike. 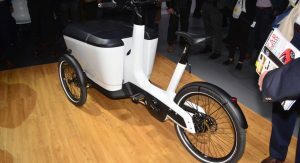 It also doubles as the automaker’s first e-bike and it just had its U.S. debut at the LA Auto Show following a world premiere at the 2018 IAA Commercial Vehicle Show in Hannover. 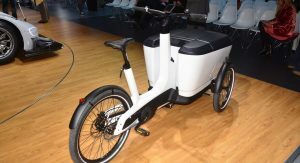 The Cargo e-Bike was designed for use in downtown areas, production plants, as well as businesses of all types and hotels. 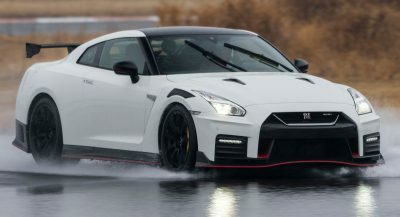 The list of potential applications is limitless, as VW points out. 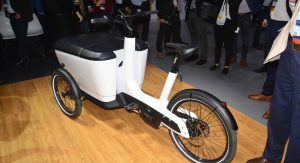 That’s because it can make emissions-free deliveries in places where a truck can’t go, like pedestrian-only city centers. 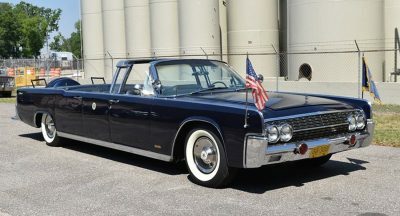 The vehicle has two wheels at the front and a load platform positioned low between them. A cargo box with a storage volume of 17.7 cu-ft (501 liters) is mounted on the load platform. 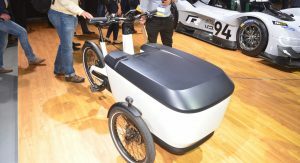 Remarkably, the Cargo e-Bike can carry a total payload of 463 pounds (210 kg), including the rider. 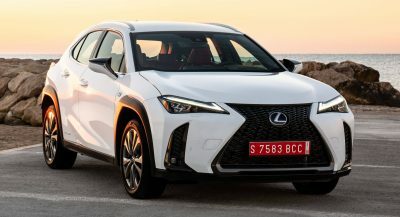 And thanks to the tilt-compensating tech, the load platform remains horizontal in turns, ensuring that the goods remain stable during transport. 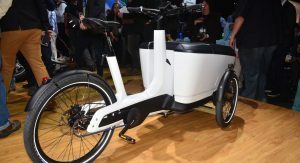 Power comes from a 250 watt (48-volt) mid-mounted electric motor that assists the rider’s pedaling at speeds up to 15.5 mph (25 km/h). 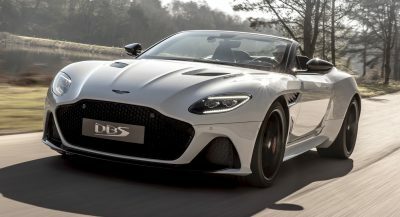 Energy for the electric motor is supplied by a 500 Wh lithium-ion battery which ensures a range of up to 62 miles (100 km). 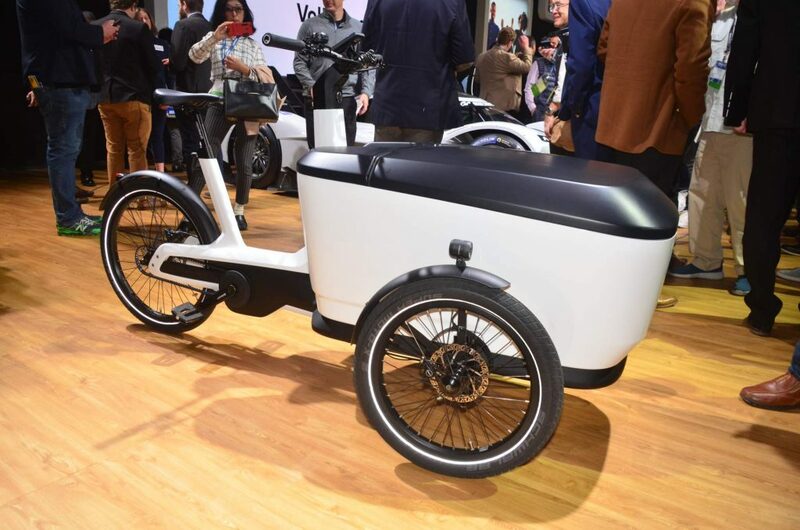 The three-wheeled vehicle is 91.1 inches (2,060 mm) long, 35.0 inches (890 mm) wide and 43.3 inches (1,100 mm) tall — up to the handlebar. 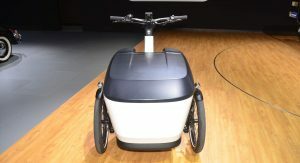 It weighs just 88.1 pounds (40 kg) without the rider. 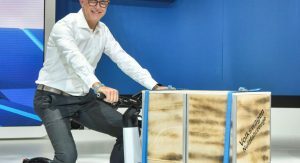 The relatively long wheelbase of 53.1 inches (1,350 mm) and low center of gravity of the load platform contribute to “a high degree of rollover safety,” according to VW. 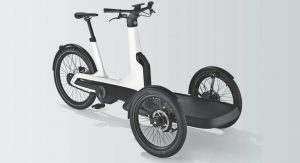 Maneuverability is also enhanced by the track, limited to 35.4 inches (900 mm), which allows the Cargo e-Bike to pass through most door frames. 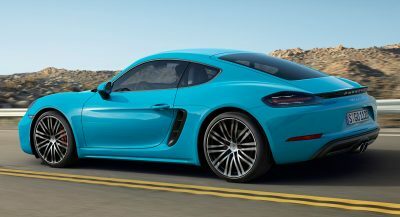 VW will build it in Hannover, Germany, with a market launch expected for 2019. 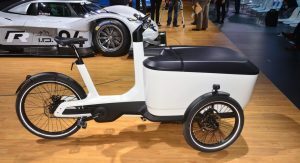 A car company making a electric cargo trike is great, but they seem to have some misconceptions from their regular business. Why do they believe keeping the load horizontal while turning is more stable? Horizontal should mean the load will move sideways in turns rather than have the resulting force being downwards into the floor of the cargo hold. For example, imagine a stack of plates or a pot full of liquid and wether it should tilt as the rider does, or remain horizontal when turning. 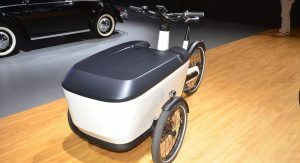 Good point, but on the VW Cargo trike the rear part with the rider is leaning / carving. It is half a carver. Separating rear and front seems quite complex too, but could of course make it cheaper to manufacture, in particular with strong load bearing properties. Either way, markerting it as a bonus and the horizontal load being more stable seems false to me. (The back is leaning because it would otherwise make the trike and the rider more unstable.) 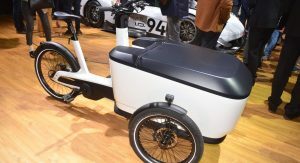 Examples of cargo trikes with full carving is Butchers & Bicycles and Babboe Carve Mountain, none being more expensive than the VW cargo bike. 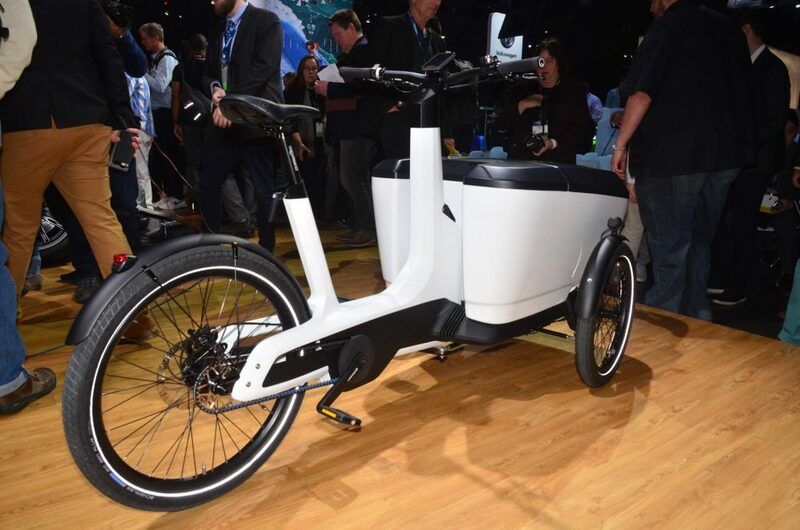 Which by the way has plenty of similarities to the cargonaut cargo trike.